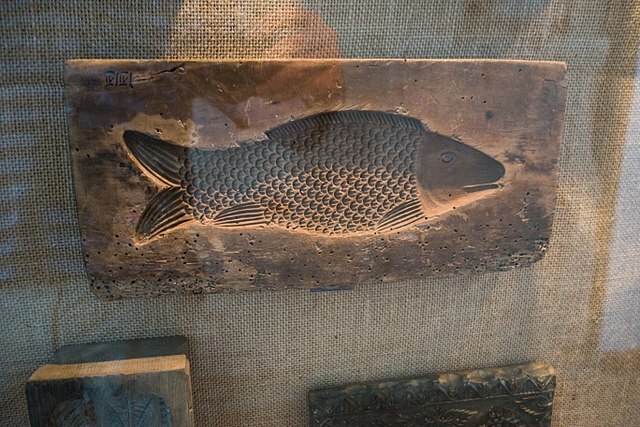 A cast and a mold have become the most common forms of art of many industries in reproducing the 3D imprints of objects or organisms. Almost anything can be made using the casting and molding processes. When looking around, everything from jewelry, equipment, kitchenware, toys, and many more, has undergone the process of molding and casting. These art forms are also used largely in fossils in reproducing sculptures. This article explores the main difference between a cast and a mold. A mold is an impression of an object or organism. It precedes a cast which is a final step in making a replica of the object or the organism. The mold is used to capture the entire details of the object before a cast is made. It can be natural or synthetic. With regard to a natural mold of an organism, the organism will normally be buried in the sediment where it is left to decay or dissolve. The imprint that the organism leaves on the spot is the mold and it can be filled to make a cast. A mold can also be synthetically made where a hollow block or cavity is filled with a pliable material. The process of making a mold is called molding, which is basically the process of creating an impression of any object to be filled with an assortment of materials. Usually, the material can be spread or poured into or onto the particular molded object to allow it to set or harden. If the object or organism is complex, multiple molds can be made. Simple objects require only a single mold. There are many materials that are used to make molds, and these depend on the desired shape and the size of the object. Plaster is the popular material often used because it is cheaper and produces hard results. Silicone rubber, polyurethane, polysulfide, wax, clay, thermoset mold rubber and liquid latex rubber are some of the common soft molding materials also used in creating negative or reverse impressions of objects. Other custom non-toxic compounds can also be used to mold human parts that can be applied onto the skin. Each industry may have its own techniques of making molds. Also, there are different types of molding methods which include extrusion molding, blow molding, injection molding, laminating, compression molding, matrix molding, transfer molding, rotational molding and thermoforming. A cast is the final step the follows a mold. No cast can be made in the absence of a mold. Before a cast is made, the casting material is spread or poured into the mold of the organism or object to make a final 3D imprint. There could be multiple cast results from a single mold. Similarly, there are many materials that can be used when casting a product. In engineering, a metal is heated to extremely high temperatures until it turns into a liquid. This liquid can be poured into a mold to make any required product of a desired shape and size. That is how jewelries and equipment are made in metalworking. The liquid will be left to harden before a cast can be made. Many materials such as plastic resin, concrete and plastic can undergo the casting process. The same materials that were used in the molding process can be used for casting. These could include silicone, polyurethane, gypsum, epoxy resin, or liquid latex rubber, but can be reconfigured to suit the outcome of the cast. If the mold was made with multiple pieces, the casting material can be poured or injected through several openings to complete a complex cast. Provided the mold was perfectly made, casting is not a complicated process at all. There could be minor adjustments in the process such as finishing or sanding the object. The materials used for molding an object can be the same ones used when casting, but not always a case. The materials in casting could be re-formulated to achieve a specific purpose. The common materials include polyurethane rubber, wax, epoxy resin, polyester resin, and gypsum. A mold precedes a cast. When molding a fossil, the organism is left to dissolve or decay in the sediment where it will leave a mold. In engineering, a mold can be synthetically made out of any object. Then a cast is the subsequent step of filling the mold with specific materials to make a final product. A mold is made through a process called molding while a cast is made through a process called casting. 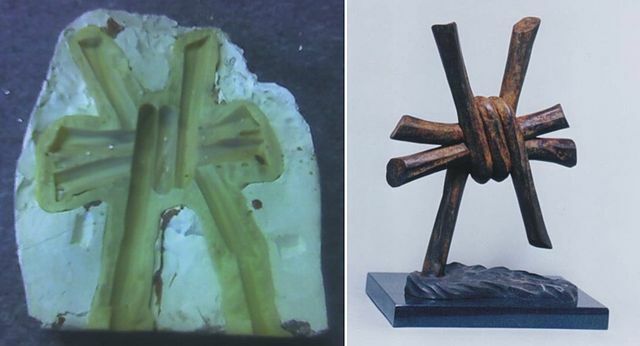 Both a cast and a mold are common art forms used in many industries and institutions to make 3D imprints. Lusi Madisha. 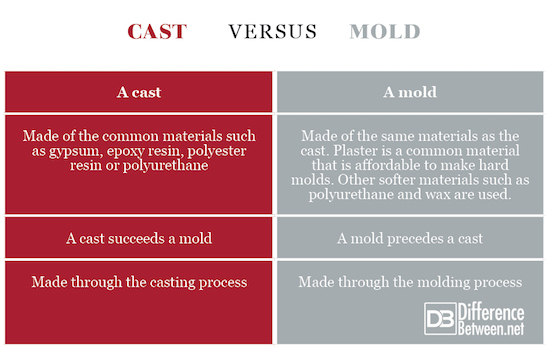 "Difference Between Cast and Mold." DifferenceBetween.net. June 4, 2018 < http://www.differencebetween.net/language/difference-between-cast-and-mold/ >. Guangde Zhang, Quanjie Gao, Qiang Xu (2015). Advances in Engineering Materials and Applied Mechanics: Proceedings of the International Conference on Machinery, Materials Science and Engineering Application. CRC Press, China (07 October 2015).